Building Performing Equipment, Inc.® (BPE) in Hillsdale, New Jersey is in the business of turning your commercial or residential building into a savings powerhouse! Not only do our products save energy and reduce your carbon footprint, they do so while cutting your heating, cooling, and ventilation costs. As of March 1st, 2014, our manufacturing company has saved $25,229,815 or 149,653,309 kWh in electricity and $25,941,356 or 18,332,932 therms of natural gas. * Equivalent number of passenger cars taken off the road in 1 year, based on estimated average 12,500 miles traveled per year, releasing an estimated 11,450 pounds of CO2 per year as defined by the EPA. Although the technology of heat and/or energy has been a viable idea for more than 20 years, it has failed to become a mainstream plan due to problems associated with high initial expenditure, fragmented product choice, high operating costs, low reliability, problematic cross contamination, and overall lack of long-term product durability. However, recent advances in energy recovery technology make Energy Recovery Ventilators (ERVs) economically feasible. 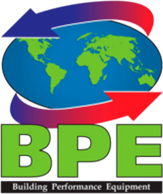 BPE ERVs boast higher thermal efficiencies (up to 98%), no cross contamination, high reliability, energy efficiency ratings (EERs) ranging from 36 to 160 EER (compared to an industry average of 10), and no moving parts for improved long-term durability and little demand for maintenance. Up to 98% thermal effectiveness due to patented reverse counter-flow construction, which allows for reductions in peak demand as well as significant energy savings. – Up to 34% latent effectiveness (humidity) during high-temperature, high-humidity summer conditions thanks to the use of Regenerative Condensate Return™, also known as “RCR”. – High thermal efficiency allows the unit to act as a stand-alone heat recovery ventilator when infrastructure does not permit extensive and costly renovations. Contact us to learn more about the dollar and energy savings we offer.